The Granby Street Salvation Army Barracks, October 1958. The Granby Street Salvation Army Barracks, at number 43 Granby Street, had been erected in 1828/29 as the Granby Street Unitarian Chapel. It became the Granby Street Primitive Methodist Chapel in 1864. 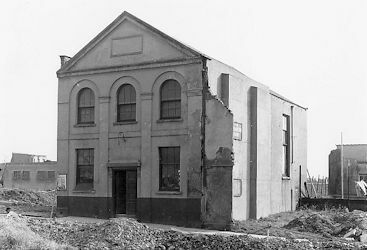 It was being used by the Salvation Army in 1890 and remained in their occupation until it became one of the few buildings in Granby Street to survive the Second World War and was demolished during the 1960s by Plymouth City Council.